The Langtang Valley is located only 19 miles north of Kathmandu , close to the border of Tibet , below the main crest of the Himalaya . The valley is dominated by Langtang Lirung (7246m), the highest peak in the area. This trek with its optional climbs of Yala Peak and Naya Kanga offers a wonderful introduction to mountaineering in the Himalaya , among some of the most beautiful scenery in the whole of Nepal . Our trek begins with a 6 hour drive to Dhunche. Initially we trek through sub-tropical jungle, then dense forest of oak, birch and pine before the valley opens out into alpine meadows and yak pastures. In the spring these high meadows are carpeted with a rich variety of alpine flowers - gentians, violets, edelweiss and primulas to name just a few - and the forests are also in full bloom with rare tree orchids and the colourful rhododendron. The Langtang forests are also known for their wildlife, including red pandas, Himalayan black bear, wild boar and langur monkeys.? ?We trek up the valley to Kyangjin where we camp in a superb setting, dominated by the fluted north west face of Kangchenpo, whilst Kyangjin Ri provides a splendid viewpoint. From Kyangjin we move further up the valley to Yala, a small yersa (summer hamlet). Basing ourselves here allows time to walk to the top of Tsergo Ri (5066m), the highest point on a broad flat plateau. The views from here are as spectacular as anywhere in the Himalaya , a 360 degree panorama of snow capped mountains including Langtang Lirung, Pemthang Ri , Langshisha Ri , Dorje Lakpa, and Kangchenpo. Our base at Yala also provides us with the opportunity to climb Yala Peak (5500m). 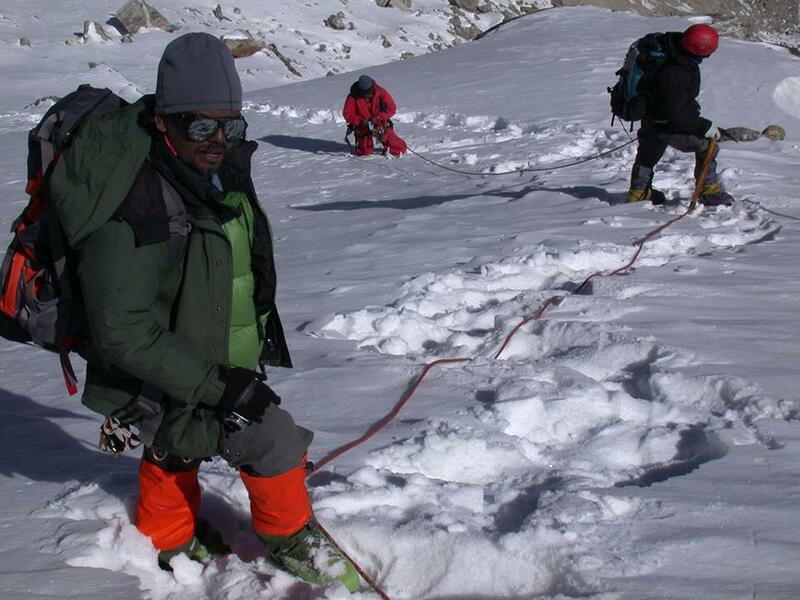 This is not technically difficult and provides good acclimatisation and training for our climb of Naya Kanga (5844m). The climb is straightforward being little more than a walk up steep snow slopes of around 30 degrees. The view from the summit is breathtaking - magnificent snow capped peaks all around and views across to the mountains of Tibet , including Shishapangma. For anyone not wishing to climb Yala Peak and Naya Kanga, there is every opportunity to explore the spectacular upper Langtang valley. Our camps are in superb locations, the trekking is not difficult and there are many good options for day walks from our base camps. The trek to and from the Upper Langtang valley is a 'classic' in its own right. We descend from the upper Langtang Valley as far as Syabru before following a different trail, past Sing Gompa, to the sacred lakes of Gosainkund. We cross the Laurebina La (4610m) and return to Kathmandu through the lovely villages of the Helambu region.